Stagnating sales in the US and continental Europe always has its own price and benefits. Apple is paying the price of concentrating more and more on these countries while Samsung has been serving out variety of tech devices to China and India. Amazon too is following suit. Just weeks after its launch of Kindle Paperwhite and Kindle Fire HD in China, Amazon has announce launch of both the devices in India starting June 27. As said above the Amazon Kindle Paperwhite e-reader comes with a black-and-white screen which Amazon promises to have 25 percent more contrast that can be read even in direct sunlight. With the Paperwhite, you can pack upto 1,100 books, and it has 62 percent more pixels for better resolution. Kindle Paperwhite has 6 font style and 8 font size options. The Paperwhite will come with a new 'Time to Read' feature which will tell you the time remaining for you to finish the book based on your reading speed. In addition to that, Amazon claims that readers have a massive book selection to pick from, at low prices. "Over 600,000 titles at Rs 200 or less." 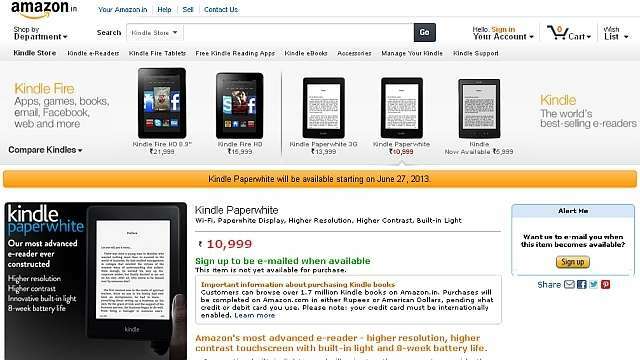 Visit Amazon's market place here to get the Paperwhite or place a request. The 8.9 inch Kindle Fire HD has a full HD IPS display with a 1920 x 1200 resolution, while the 7-inch tablet gets a 1280 x 800 resolution display. Both tablets have a laminated touch sensor that Amazon says reduces glare from overhead lights. The tablets will also feature Advanced True Wide polarizing filters that help improve viewing angles. The 8.9-inch Kindle Fire HD is powered by a 1.5GHz dual-core TI-OMAP4470 processor and a PowerVR SGX544 GPU, along with 1GB of RAM. The 7-inch version gets the TI-OMAP4460 dual-core processor, which is clocked at 1.2GHz. It also has a PowerVR SGX540 and 1GB of RAM. The Kindle Fire HD duo comes with dual-band Wi-Fi and can automatically switch between the two networks. The tablets are available in 16 or 32GB versions. In addition, users get free unlimited storage on Amazon Cloud. All digital content purchased through Amazon is automatically backed up in the Amazon Cloud's Worry-Free Archive for access anytime. Both have a HDMI-out ports and Bluetooth support. Both tablets have a 1.3 megapixel front-facing cameras that can be used for the custom Skype app for Kindle Fire HD. The biggest advantage of buying Amazon's tablets is access to a large selection of digital content, including millions of books, games and Apps. Amazon says both tablets should be able to stay powered on for 10 hours on a single charge. 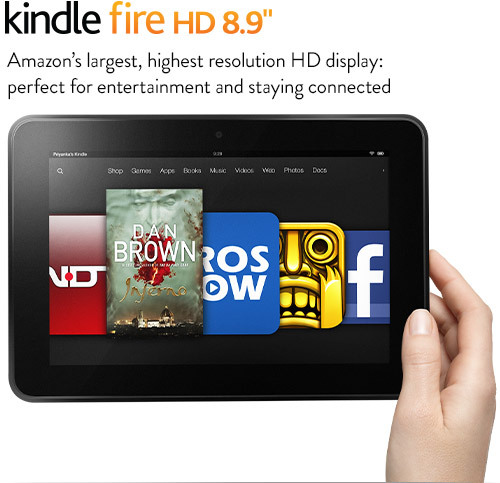 You can buy the Kindle Fire HD here. Amazon has also launched a India specific App store where you can find variety of Apps, Games and e-books which will satiate your every need. The App store also gives one paid App or Game as a freebie every day.